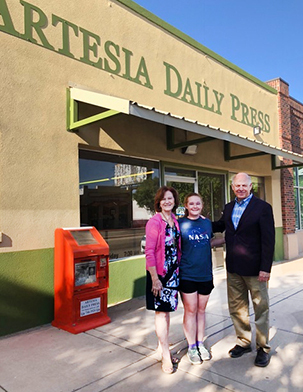 U.S. Representative and New Mexico gubernatorial candidate Steve Pearce made a stop Friday at the Daily Press offices to share his thoughts on some of the issues currently facing the state and the nation. What is your current stance on immigration? “We all want legal immigration, so we need to secure the border, and we also need to just overhaul the immigration system completely. What are your thoughts on the impending Supreme Court nomination? “We are excited about the pros of getting a nomination. We’re watching as that develops. I believe that we will see a nomination sometime before the end of the month, and maybe during that August period, we may see the confirmation. How do you feel about the Supreme Court’s recent ruling on unions? “We felt like it was giving more freedom to individual workers to decide which way they want to go. Lot of people opposing the position, lot of people supporting it. But anytime you can push liberty and freedom all the way down to the local level, I think that’s positive. Concerning your stance on education, why do you wish to eliminate teacher evaluations? “Because the teacher evaluation currently is used as kind of a thumb in the back of someone’s neck. It’s causing great anger among the teachers. So I’m saying let’s just suspend it, let’s bring everybody to the table. I’m going around the state, I’m meeting with teachers and superintendents everywhere we go. I’m saying let’s figure out a way to hold teachers accountable – they don’t mind that – it’s just the current system has got such conflict associated with it on the part of the teachers, they feel like they have no input. How do you feel about the elevator situation at Carlsbad Caverns? It affected tourism quite a bit; do you think those losses can be recouped? “I’m glad it’s up. Took too long. The management is fumbling the ball. Missed a couple of big holidays, and you can’t go back and reclaim lost tourism. The parks service nationwide understands this. The fact that they can’t get it right just says that somebody needs to be paying attention. Why should young voters vote for you? “What’s your future in New Mexico? Increase the number of jobs. Put apprenticeship programs in our high schools. If you’re not going to go to college, we still need to prep you for those jobs. Those jobs are very high-paying, especially down here in this part of New Mexico. You don’t have to go to college to succeed. We need to accelerate high-tech jobs, but we just don’t have the high-tech kids here to win those bids from outside companies. Do you have any follow-up remarks? “As we travel around the state, we’re in the middle of our campaign for governor, of course, and people want to know what makes a candidate best-qualified. My education, first of all. I studied economics, then I have lived a lifetime living economics and business, and then later, in service in the State Legislature, I was on the appropriating committee, so again – the economics background. “Then going to Congress, dealing with the budgets of the entire nation there, I think my preparation has been very good. I think my background in the military, I know what we are asking our young men and women in the National Guard to do. Our National Guards are deploying into some of the toughest combat zones in the world, so I know from personal experience about the combat. “I just believe that my background has given me the tools to lead our state properly. And people think, ‘Maybe it’s too late for New Mexico.’ I don’t think so. I just think we need good leadership and vision, and that’s what I bring to it.